Every business incurs expenses. Independent contractors, consultants, and freelancers pay for software, computers, or travel out of their own pocket to make their jobs easier. For incorporated businesses, being able to deduct expenses will reduce their business taxes. For sole proprietors, being able to deduct expenses reduces both the regular income tax and the self-employment tax. The bottom line? Keeping track of all your business expenses will go a long way to reducing your tax liabilities. The basic definition is that an expense must be "ordinary and necessary" for your trade or profession. That definition comes straight out of the tax code (Internal Revenue Code section 162). "An ordinary expense," the IRS says in Publication 535, Business Expenses, "is one that is common and accepted in your industry. A necessary expense is one that is helpful and appropriate for your trade or business." Problems arise when an expense might be partly personal and partly business-related. A common example: a freelancer might use one room in her house as an office. In this situation, we would measure the square footage of the office and of the whole house, and find the percentage. This percentage would then be used to measure the business portion of shared expenses such as rent, insurance, and utilities. The business portion of these expenses would become part of the home office deduction, while the rest of the expenses would be personal in nature. The general rule: "Generally, you cannot deduct personal, living, or family expenses. However, if you have an expense for something that is used partly for business and partly for personal purposes, divide the total cost between the business and personal parts. You can deduct the business part" (IRS, Publication 535, Business Expenses, section on personal versus business expenses). A vital bookkeeping tip is to keep track of all your expenses. That way you can review your expenses and ask your accountant if any of them might be tax-deductible. Cost of goods sold are expenses for inventory and things related to inventory. Manufacturers, wholesalers, and retailers track the cost of the products they produce or purchase for resale. The general rule: "If your business manufactures products or purchases them for resale, you generally must value inventory at the beginning and end of each tax year to determine your cost of goods sold. Some of your business expenses may be included in figuring cost of goods sold" (IRS, Publication 535, Business Expenses, section on cost of goods sold). Some expenses are recorded as assets and their costs recovered over time through depreciation. Such expenses are called capital assets because their costs are capitalized as assets of the business, and the cost is deducted over a period of time through depreciation. Examples of capital expenses include computers, furniture, equipment, and real estate. The general rule: "You must capitalize three types of costs: business start-up costs, business assets, and improvements." (Publication 535). A full-featured accounting software is best to track your income and expenses, such as Quickbooks or Sage Peachtree and will help you monitor the health of your company. As an added bonus, the better tax software programs allow you to import data from Quicken or Money. To make your tax preparation process as smooth as possible, we suggest spending some time making sure your expense categories are set up properly. You can add, delete, and modify categories in all personal finance and accounting software. By having intuitive, easy to remember categories, you'll be able to generate meaningful reports. And most programs will let you link the categories to particular line items on the tax forms. Setting this up can go a long way to reducing the amount of time you spend preparing your taxes. All the accounting programs mentioned can generate profit and loss reports (called income statements by accountants). These reports help you analyze how your freelance business is doing, whether you are profitable, and how you are spending your money. If you decide to hire a tax accountant, having these reports to expedite the preparation of your tax returns. 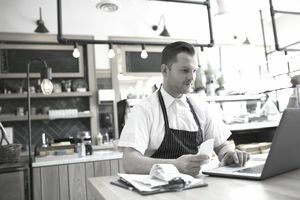 Can My Small Business Benefit from the Trump Tax Cuts?